Thai Lion Air is continuing to expand its domestic operation, driving rapid growth in Thailand’s domestic market. Thai Lion now serves nine of the top 10 domestic destinations in Thailand, having added two more in 2Q2015. Thai Lion has already overtaken Bangkok Airways and Thai Airways to become Thailand’s third largest domestic carrier after Nok Air and Thai AirAsia. Nok and Thai AirAsia are still about double the size of Thai Lion and are continuing to pursue domestic expansion. But Thai Lion is expanding faster, narrowing the gap with its LCC rivals. Thailand’s domestic market grew by about 20% in 2014 and is on pace to grow at an even faster rate in 2015. LCCs have generated almost all of the growth and now account for nearly 70% of domestic passenger traffic in Thailand. This is Part 2 in a series of analysis reports on Thai Lion, the Lion Group's cross border JV in Thailand. The first report focused on the resumption of international operations with the planned 15-Aug-2015 launch of services on the Bangkok-Singapore route and Lion Group’s overall expansion in the Singapore market. This report will focus on Thai Lion’s continued expansion in the domestic market. Thai Lion launched operations in Dec-2013 with an initial fleet of two 737-900ERs operating one domestic and two international routes. Thai Lion currently operates a fleet of 13 737-900s on nine domestic routes. The airline suspended international operations in early 2015. After starting with only one domestic route, Chiang Mai, in late 2013, Thai Lion focused on domestic expansion in 2014. The LCC added five domestic destinations in 2014 as it expanded its fleet from two to eight 737-900ERs. All of its 737s are in single-class configuration with 215 seats. Thai Lion took delivery of another five 737-900ERs in 1H2015, with most of the aircraft being placed into service in 2Q2015. Thai Lion has used the additional aircraft to launch two more destinations, Chiang Rai and Ubon Ratchathani, as well as add capacity on some of its existing routes. Services from its Bangkok Don Mueang hub to Ubon Ratchathani was launched in Jun-2015, giving Thai Lion nine domestic destinations. Thai Lion currently operates 482 weekly flights across nine domestic routes, based on data from its online booking engine. Thai Lion currently has 103,630 weekly seats, giving it about a 20% share of total domestic capacity in Thailand. The other two LCCs serving Thailand’s domestic market, Thai AirAsia and Nok Air, each have about a 40% share of Thailand’s domestic market. Nok and Thai AirAsia each carried 7.4 million domestic passengers in 2014 and about 2.3 million domestic passengers in 1Q2015. Both continue to pursue rapid expansion domestically. Nok has more domestic flights and the largest domestic network as it operates ATR 72 and Dash 8-Q400 turboprops alongside 737-800s. Thai AirAsia also has more than twice as many destinations as Thai Lion although it only operates A320s, which indicates there are still ample opportunities for Thai Lion to further expand its domestic network. Thai Lion’s initial focus has been on trunk routes and providing sufficient frequencies to be competitive with Nok and Thai AirAsia. With the exception of Phuket, where slot constraints have limited Thai Lion to only two daily flights, Thai Lion has nearly as many seats and in a few cases more seats than its two main competitors. For example, Chiang Rai and Ubon Ratchathani were both launched with three daily flights. Nok Air and Thai AirAsia both operate four daily flights to Chiang Rai, providing only slightly more seats than Thai Lion’s three daily frequencies with larger gauge aircraft. At Ubon Ratchathani, Thai AirAsia is smaller with only two daily flights but Nok currently has seven daily flights. With the recent addition of Chiang Rai and Ubon Ratchathani Thai Lion now serves nine of the top 10 destinations in Thailand including Bangkok (based on current seat capacity). As it has now established a meaningful presence on the main trunk routes Thai Lion is expected to start competing soon with Nok and Thai AirAsia in some of the smaller domestic markets. Thai Lion has stated it plans to begin serving Nakhon Si Thammarat in Sep-2015 and add Phitsanulok and Khon Kaen by the end of 2015. Thai Lion has not yet started selling flights on any of these potential new routes but all would be logical additions to its network. Khon Kaen, Phitsanulok and Nakhon Si Thammarat are the 11th, 12th and 13th largest market in Thailand based on current seat capacity. They are only slightly smaller than Thai Lion’s latest addition, Ubon Ratchathani. All three planned new destinations are now served by Thailand’s two other domestic LCCs. Nok currently has three daily flights to Khon Kaen and Phitsanulok and six daily flights to Nakhon Si Thammarat, according to OAG data. Thai AirAsia currently has four daily flights to Khon Kaen and Nakhon Si Thammarat and two daily flights to Phitsanulok. Thai Lion will easily have the capacity to launch new domestic destinations in 2H2015 as well as continue to add frequencies on existing routes. Thai Lion expects to end 2015 with a fleet of 20 737-900ERs, which would require seven deliveries in 2H2015. 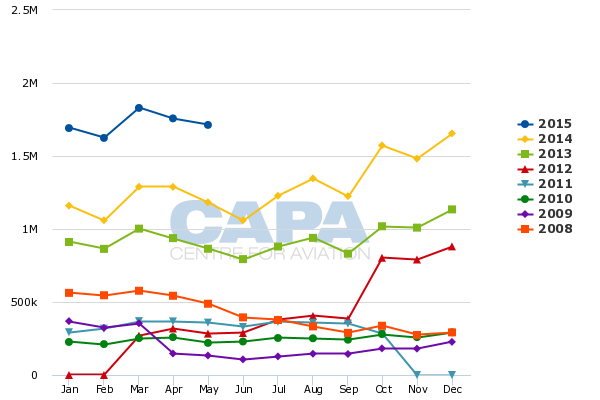 The carrier is also not yet fully utilising all the additional aircraft it took in 2Q2015. Some of the additional capacity will be allocated to the international market. In addition to Singapore, Thai Lion is looking at launching services to China and Taiwan in 2H2015. But most of Thai Lion's expansion will likely again be in the domestic market, particularly given the regulatory obstacles now confronting all Thai carriers seeking to expand in North Asia in the aftermath of the Thai DCA failing an ICAO audit. Thai Lion initially delayed international expansion in 2014 due to the civil unrest in Bangkok, which impacted inbound visitor numbers. Tourism has since recovered but Thai Lion now faces new regulatory obstacles from most North Asian countries. Thai Lion also has an unknown international brand, making new international routes more challenging and riskier than domestic expansion. Domestic demand has continued to grow steadily, making domestic expansion an attractive option. Domestic traffic in the Bangkok market increased by 19% in 2014 to 23.8 million passengers, according to Airports of Thailand data. The pace of growth has accelerated even further so far in 2015 with Airports of Thailand reporting a 27% surge in domestic passenger traffic at Bangkok’s two airports through the first five months of 2015 to 12.3 million. LCCs have driven all the growth in the Thai domestic market over the last year and a half. Bangkok had 3.7 million more domestic passengers in 2014 than 2013 with LCCs carrying 4.2 million more passengers and FSCs carrying 500,000 fewer passengers. Through the first five months of 2015 Bangkok had 2.6 million more domestic passenger than the same period of 2014 with LCCs accounting for 2.4 million and FSCs accounting for the remaining 200,000. The 6.6 million additional domestic passenger carried by LCCs over the first 17 months after Thai Lion launched have been roughly split equally between Thai Lion, Thai AirAsia and Nok Air. But Thai Lion is the main driver of the growth as its rapid expansion has led to faster expansion from the two established LCCs. Combined, Thai Lion, Thai AirAsia and Nok carried 15.2 million domestic passengers at Don Mueang in 2014, representing 38% growth compared to 2013. This trio carried 8.3 million domestic passengers at Don Mueang in the first five months of 2015, representing 41% growth compared to the first five months of 2014. Thailand’s three domestic LCCs have been able to stimulate rapid growth and have not been relying on taking market share from FSCs. The stimulation however has come at the expense of yields – as would be expected from the huge increase in capacity. Demand is robust as Thailand’s middle class population continues to expand and Thais increasingly switch from buses and trains to budget carriers for domestic travel. But capacity has increased faster than demand, pressuring yields and profitability. Thailand’s domestic market will likely not be able to continue to support the very high growth rates it has seen over the last couple of years. There will still be room for full service carriers offering domestic connections for long-haul passengers, particularly as all three domestic LCCs are based at Don Mueang while Thai Airways and foreign full service carriers are at Suvarnabhumi, where there are currently no domestic LCC flights. FSCs also continue to provide the only link to Samui, one of Thailand’s most popular tourist destinations. Bangkok Airways is currently the largest full service carrier in Thailand’s domestic market with about 100,000 weekly seats including about 30,000 seats on the Bangkok-Samui route. While about 60% of Bangkok Airways’ domestic capacity is on routes served by LCCs its exposure is relatively limited as it has a fairly small presence in these markets, enabling it to focus on its niche feeding foreign carriers. Thai Airways also has cut back its domestic operation in recent years, enabling it to focus more on connections to its long-haul network. Thai Airways is now the fifth largest domestic carrier in Thailand although Thai is still the third largest domestic player – ahead of Bangkok Airways and Thai Lion – when also including flights operated by its full service regional subsidiary Thai Smile. Bangkok Suvarnabhumi recorded a 1% drop in domestic traffic in the first five months of 2015 to 3.7 million passengers. While Bangkok Airways has continued to expand domestically – albeit relatively modestly – Thai Airways has continued to reduce capacity including by down-gauging some flights to Thai Smile. Thai Smile has taken over several domestic routes from Thai Airways but also now operates three domestic routes from Don Mueang which it launched in Aug-2014. Don Mueang overall recorded 44% domestic passenger growth in the first five months of 2015, driven by the 41% LCC growth and the new services from Thai Smile. LCCs accounted for 96% of domestic passenger traffic at Don Mueang in the first five months of 2015 and currently accounts for about 95% of domestic capacity at the airport. Nok currently has a leading 41% share of domestic LCC seat capacity at Don Mueang compared to 38% for Thai AirAsia and 21% for Thai Lion. When also including full service carriers, Nok has a 39% share of domestic capacity at Don Mueang followed by 36% for Thai AirAsia, 20% for Thai Lion, 5% for Thai Smile and less than 1% for Orient Thai. Don Mueang currently accounts for 95% of total domestic LCC capacity in Thailand. Point to point routes bypassing Bangkok account for only 2% of Thai Lion’s capacity as Thai Lion currently operates only one such route, Hat Yai-Udon Thani. Thai AirAsia currently allocates about 10% of its domestic capacity to point to point routes while Nok allocates only 1%, according to CAPA and OAG data. There are opportunities for LCC growth on point to point routes. But Thailand’s LCCs are expected to continue focusing primarily on expanding at Don Mueang, including new links from Bangkok to secondary cities. Smaller regional carriers such as Kan Air are generally better placed for the thinner point to point markets. Thai Lion briefly operated in 2014 two secondary domestic point to point routes using an ATR 72 but dropped the routes and returned its only turboprop to the Lion Group after only about six months. Thai Lion’s focus is clearly now on establishing itself as a major player across all domestic trunk routes. The Lion Group has been keen for Thai Lion to pursue strategic domestic expansion, concerned that if it waits it risks losing out to other carriers. The group has therefore been allocating more deliveries to Thai Lion than to its LCCs in Indonesia or Malaysia. In 1H2015 Indonesia’s Lion Air and Malaysian affiliate Malindo Air only took delivery of two 737s each while Thai Lion took five aircraft, according to the CAPA Fleet Database. The focus on Thailand is poised to continue as seven more 737s have been allocated for Thai Lion in 2H2015. This is more aircraft than Thai AirAsia or Nok are planning to add for the entire year. Thai Lion may not end 2015 with 20 aircraft, as there is always a lot of flexibility in the Lion Group fleet plan. But Lion’s focus is clearly on Thailand and – at least for now – primarily the domestic market. It is hard to predict when Thai Lion or the overall Thai domestic market may reach a ceiling. The rapid growth recorded so far in 2015 by Thailand’s domestic LCCs will not be sustainable over the long term. But over the short term the expansion seems set to continue as Thai Lion has proven it is not afraid to battle longstanding LCCs Nok and Thai AirAsia.